From 1888, refurbished set of four extra heavy duty casters in rare, double wheel design. Small circular mounting plate with thick stem is ideal for secure mounting to slim furniture legs. Dated August 28, 1888. 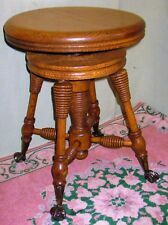 AN ANTIQUE, SOLID WOOD, ORGAN, OR PIANO, STOOL WITH A ROUND, SWIVEL, ADJUSTABLE SEAT AND IRON CLAW AND GLASS BALL FEET. IT IS CIRCA 1890 TO EARLY 1900's. IT HAS BEEN PROFESSIONALLY REFINISHED AND IS IN EXCELLENT CONDITION. IT IS CIRCA 1890 TO EARLY 1900's. IT HAS BEEN PROFESSIONALLY REFINISHED AND IS IN EXCELLENT CONDITION. Features a very ornate, stylized lion head with fangs bared and a lion paw foot. Labeled and marked 1846 Manufactured in France Paris. Label is 100% correct and genuine. Glass feet. All original. Refurbished set of 4 large furniture swivel casters. Heavy duty cast iron with remnants of original copper finish. White porcelain wheels. Circular mounting plate make these ideal for secure mounting to slim table legs. 26-1/2" wide from side end to side end,and approx. 21" high to top of handle area,and approx. The light has been superbly engineered, and features a die cast ventilated body, 360 degree rotation, Iconic circular design and an internal reflector. The Light gives a wide beam spread for feature / architectural lighting and showing specific objects such as a work of art. A VERY FINE, ANTIQUE, CHILD'S BLACK EBONIZED WOOD, PLATFORM ROCKER IN ELEGANT VICTORIAN DESIGN CIRCA 1875-1880. NOTE: THE APPARENT DIFFERENCE IN COLOR SHADING OF THE FABRIC IS DUE TO REFLECTIONS IN THE PHOTOGRAPHY PROCESS. Refurbished set of four pressed steel furniture casters. Model #7 by Universal Caster. Hand washed, lubricated and ready for use. Roll and swivel beautifully. 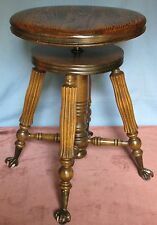 Antique Table Casters. Originally designed in Covent Garden, London at the Strand headquarters in the 1950s. The Light gives a wide beam spread for feature architectural lighting. The light is a rare and original British Industrial design classic. AN ANTIQUE, SOLID OAK, ORGAN, OR PIANO, CHAIR/STOOL WITH A FIXED BACK AND ROUND, SWIVEL, ADJUSTABLE SEAT AND IRON CLAW AND GLASS BALL FEET. IT IS CIRCA 1890 TO EARLY 1900's. THE LEGS END IN IRON, TALON/CLAW FEET AND GLASS BALLS. Refurbished set of four late 1800's furniture swivel casters of thick iron and steel. Small circular mounting plate with thick stem make these ideal for secure mounting to slim table legs. Hand washed, lubricated and ready for use. A BEAUTIFUL, ANTIQUE, DECORATIVE, GOLD PAINTED, CAST IRON, VANITY, SLIPPER, RADIO, OR PIANO BENCH/SEAT WITH ITS UPHOLSTERED, ONE-BOARD, SOLID WOOD SEAT. IT IS CIRCA LATE 1800's-EARLY 1900's. THE RECTANGULAR SEAT IS HELD IN PLACE WITH SIX SCREWS. Beautiful Antique / Victorian era unique Horse shoe style foot rest footed. Overall all complete and solid plus is strong. Has wear to finish and fabric but Beautiful. Set of 4 antique furniture casters. Features a hardwood ball wheel hand forged onto steel forks. They swivel in their original sleeves, dated April 5, 1882. Will raise your piece 1 1/4”. 1 1/2” long, 3/8” wide sleeves. Up for sale is this lot of 2 matching castors. still in usable condition. A big, solid wall nut veneered wall cabinet with two old hangers on the back and with four feet, so it could be displayed hanging on a wall or standing on a table, sideboard,…. Victorian Wall Cabinet. Made of solid quarter sawn oak. Original old finish is fine. Larger box still has the original satin lining and the smaller one only has it inside the lid. Antique wall cabinet. Cabinet dates to ca 1889. - you can check yourself (Rates in EUR). This oak hall tree is in the original finish. The round piece that supports the fancy hooks will rotate freely to turn if your jacket would be on the back side. Circa 1900. A place where you can deal and be assured that there are NO REPRODUCTIONS! Very nice antique ornate metal and marble top table. 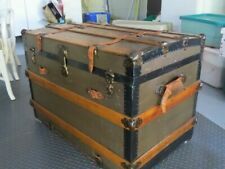 In very good condition with normal antique distressing. Minor small chips to the two marble pieces and restorable rust on the bottom of the feet. The table is about 30" tall and 15" in diameter. Local pick-up available to save on shipping. Will likely ship disassembled.